Facebook announced earlier today that major changes are coming to WhatsApp soon. 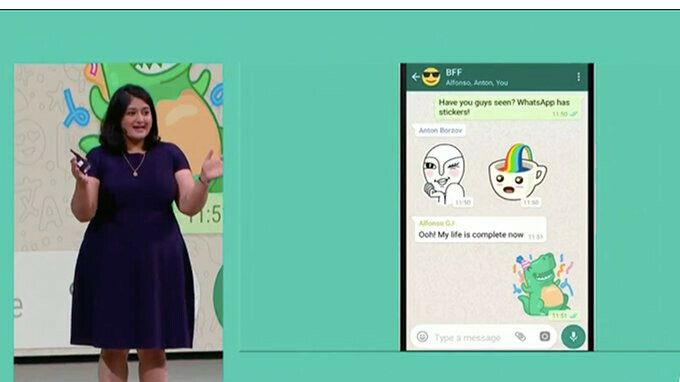 Among the most important, group video calls will arrive “in the coming months,” WhatsApp's director Mubarik Imam confirmed during F8 conference. While she didn't offer any additional details on the upcoming feature, she did reveal screenshots that show four people simultaneously participating in a video call, although it's unclear if that's the maximum number supported or one that's been randomly chosen by WhatsApp to demo the feature. Furthermore, Imam said WhatsApp will get stickers, in the same vein as Facebook Messenger. Unsurprisingly, Facebook will allow third parties to design their own bundle of stickers and offer them to WhatsApp users. Business-wise, WhatsApp plans to add some improvements to its Android app in the form of providing various perks to major brands in exchange for money. In other news, Imam announced that over 2 billion minutes of video and audio calls are made through WhatsApp each day and that the messaging service has more than 450 million daily users. Hopefully none of my contacts would ever send me a sticker but the group video call thing is cool. I feel bad for BBM. They have cute stickers.